Released two weeks ago on the European PlayStation Store, developer Frozenbyte and publisher Nobilis are nearly ready to release the award-winning physics platformer Trine in the states. Trine has been available on the PC for quite some time, but on the PlayStation 3 it's been only our friends over in Europe who've gotten to purchase and put the game's heroic trio through their paces. That ends on October 22nd, when Trine finally sees a U.S. PlayStation Store release. I'm not sure why the European and U.S. releases were separated by a month, but I'm guessing it has something to do with Nobilis being a French publisher and all that entails. 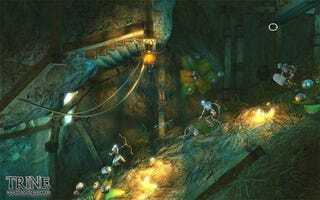 Those interested in checking out Trine when it hits the PlayStation Store would do well to read Luke's review of the game, to see how a burly Australian man feels about it.